The flag of St. Vincent and The Grenadines is composed of a vertical tricolour of blue, gold (double width) and green with three green diamonds arranged in the V pattern centred on the gold band, which represent the Grenadine Islands which fall under the government of Saint Vincent. These diamonds recall Saint Vincent as the “gems of the Antilles”. Blue represents the tropical sky and the crystal waters, yellow stands for the golden Grenadine sands, and green stands for the islands’ lush vegetation. The diamonds are set low on the yellow band, recalling the nation’s location in the Antilles. The previous flags had a realistic breadfruit leaf, where the gems are now, emblazoned with the coat of arms of Saint Vincent and the Grenadines. 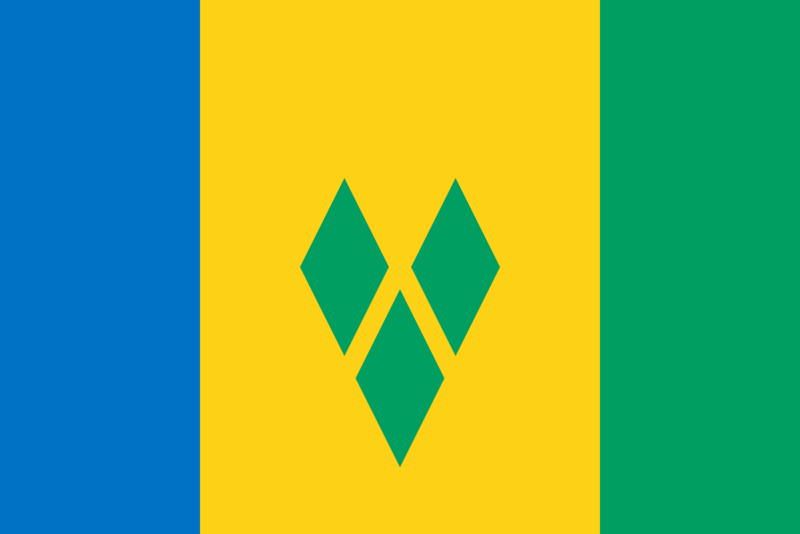 The flag of Saint Vincent and the Grenadines was adopted on 21 October 1985.